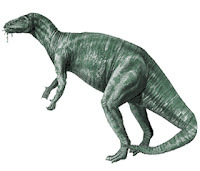 Camptosaurus, meaning "bent lizard", were plant eating dinosaurs that spent most of their time on their hind legs. The larger ones were too heavy and probably had to move around on all fours. Their front arms, which had five fingers, were smaller than their hind feet, which had four toes. All of the fingers and toes were like hooves. It had a long snout with a horned beak at the front and hundreds of grinding teeth in the back of its mouth. One of the most interesting facts about the Camptosaurus is that it had cheeks much like humans. This means that they could hold food in their mouths and chew it unlike other herbivores that had to swallow their food whole. The Camptosaurus lived in thick forests close to rivers. It probably lived in herds and this would have given it protection from their main meat eating predators, such as the Allosaurus.